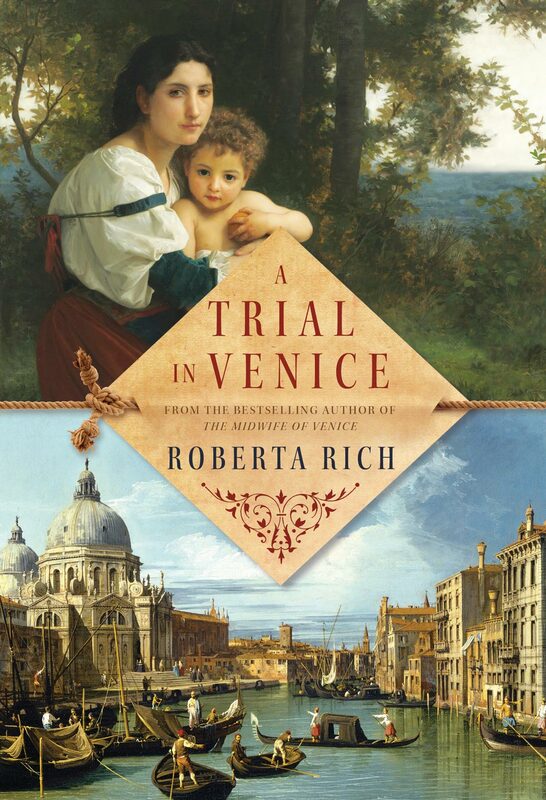 Thanks to the fabulous people at Random House of Canada, I had the opportunity to sit down with Roberta Rich, author of The Midwife of Venice and the newly released sequel The Harem Midwife last week. We chat about everything from traveling, books, good TV and make-up in my hour-long interview with the bestselling author. You were originally born in the U.S. and now split your time between Canada and Mexico. What led you to originally move from New York to Vancouver, and then venture out to Mexico as well? Was it the climate? No, it wasn’t a climate thing. There are usually two reasons why a woman moves: one is a job and the other is a man. Those are usually the only two excuses for leaving. I grew up in Buffalo, NY and I left when I was about nineteen. My first husband had a job at the University of Calgary so my first city in Canada was Calgary and then he got a job at University of BC so we moved to Vancouver. That was many years ago. I am much more Canadian than I am American. I do have dual citizenship. Before becoming a best selling author you had a variety of jobs including a divorce lawyer and nurse’s aide. How did those positions prepare you for your writing career, if at all? I think all jobs prepare you in some way. I think all jobs build your character and develop your skills. As far as being a lawyer was concerned, I was a divorce lawyer – a family law lawyer – for 26 years and it doesn’t help your writing. Drafting legal documents doesn’t help your writing as a fiction writer but I do think lawyering does teach you self discipline, perseverance and hard work. All those boring character building traits are so useful in almost any career. I guess as a family law lawyer, you see people at their worst. You see people who are very badly behaved… and that’s always useful. It gives you an insight into revenge, hatred, intrigue, lying, backbiting. It gives you some insight into the way people act under pressure. When I was a nurse’s aide, I worked in a neo-natal clinic it was a very low level job at Millard Fillmore Hospital in Buffalo. You pick up, as a nurse’s aide, a fair bit of medical knowledge and knowledge about birthing so I think that was useful. How did you fall into writing or had you been writing throughout this whole time? I’ve always been a writer. I started writing in high school and I always was interested in writing. When I was a lawyer I generally wrote short stories simply because it seemed like a doable project as opposed to a novel which was a very long project. So I’ve always been a writer. I used to write mystery stories. I wrote a couple of mystery stories which have never seen the light of day. Probably rightly so. Then in 2007 I was in Venice with my husband and I got the idea to write a historical novel. And it was completely different from anything else that I had ever written. But what happened was, we were on a walking tour of Venice and we started at the Rialto Bridge and we ended up in the Jewish ghetto which I have to confess I had never heard of before and I was very struck by the ghetto and when I got home, I thought I’ll find a historical novel that’s set in the ghetto. I’ve always loved historical novels.. I’ve always read them. And I thought this would be a good way of getting the feeling for what it’s like to live in the ghetto and there was no such novel. There were, not that I discovered anyway, there were no novels set in the Jewish Ghetto and so I thought this is a gap that must be filled. And so I started doing some reading and some research and The Midwife of Venice was born. The bio on your website is quite humorous but your novels are of a more serious tone. Have you ever thought about penning a lighthearted story? I often think of that because I’m not really a terribly serious person and yet my novels are rather serious. My mystery stories were funny because I had my main character as a Vancouver divorce lawyer so she got into a lot of scraps and fights and it was some bantering, some romantic interest in that. I think it would be very interesting and fun to try writing comedy. I think it’s very difficult, I think it can seriously go off the rails. But I do, in interviews, have fun. We laughed about hating to write bios and what you put there will come back to haunt you later. Rich thinks she sounds pompous in the bios but we often do have to say these things because authors and readers want to know more about the personal lives. She spoke about spending the cold months in Mexico, leaving actually on December 1 and staying until about Marc but if she lived in Toronto, she’d probably go November 1st because of our weather. With The Midwife of Venice, how long was your writing and publishing process for this first book? Did you have prior knowledge or did you have to do a lot of research? Well I got the idea for the book in 2007 and it came out in February of 2011, so that’s four years. But I started writing it as soon as I discovered there was nothing set in the Jewish Ghetto. This is kind of a good idea. I think people might be interested. Of course the more I read, the more research I did about Venice and about the Jewish ghetto in particular the more I thought, I don’t know why somebody else hasn’t written a novel because it’s such an interesting time period. I kept thinking I must be missing something because this is such an obviously interesting period of history that somebody has written about, surely. I never came across one. [Research wise], there’s no shortage of information on Venice and the Jewish ghetto. Did you get a chance to go back since writing Midwife of Venice? We were in Venice twice. 2007 and we came back in 2008 and we rented a little studio apartment just on the other side of the bridge from the Jewish ghetto. so that was fun. It was a well away from St. Marks and all the very heavily touristy areas. It was very fun to be there at night. Venice at night is very spooky and very deserted and there are no cars so it’s very quiet. And you walk along the canals and it’s very shadowy and you can hear the drip drip drip of the water coming off the oars. Once in a while you’ll hear shutters open and close. The aural effects are quite dramatic and I just love the city. I don’t think I could ever set a book in a city I didn’t love. You have to be in love with it because writing a novel is a long and arduous process and there has to be a real deep sense of connection. You really have to get fired up about a subject. I personally would find it hard to sustain for the two or three years that it takes. Do you find that the city has changed a lot now from the days of your research and book setting? I think the Jewish ghetto looks very much today that it did 500 years ago. I don’t know if you’ve ever been to the Tenement Museum in NY. They’ve taken an old tenement that was built about in the 1860s or so and they have taken 3 apartments and they’ve looked at the census for the city of NY to find out various families who have lived in these apartments then they have recreated these apartments as they were in about 1860 and one was an Italian family, one was a Polish family and one was a Jewish family. And I was going through the ghetto, Wouldn’t it be wonderful if they had done something like that in the Jewish ghetto. I find that sort of thing very very interesting. When I described Hannah’s apartment in the ghetto, I just used my imagination because we didn’t know exactly what it was. The only thing I knew was that the buildings existed. The ghetto was started in 1516, the buildings existed but as more and more Jews came from Europe, the apartments got smaller and smaller. They subdivided the apartments, and then they subdivided horizontally. So they lowered the ceilings and it was crammed. Super crowded and of course I thought, how did they cook and how did they heat water. Well they all had little charcoal braziers so you can imagine the fear of fire must have been overwhelming because the ghetto had gates that closed and locked at night. And were not unlocked until the morning. It’s kind of a double-edged sword because it was to keep the Jews in and it was to keep them safe from Christians outside. I think of a fire and of being locked in and it makes me feel very claustrophobic. I love how strong of a female character you make Hannah to be. Was she how you envisioned her from the beginning or did the essence of her develop as you wrote the book? I wanted a strong character. I like stories about fairly ordinary people who find themselves by the operation of fate or whatever in difficult situations where they have to make hard moral choices. In The Harem Midwife I’ve started from a similar premise. Hannah is called to the palace and she has to certify that a young girl is a virgin and what does she do when she finds out that the girl is not. Does she lie or does she maintain the level of trust with the palace? So I like those.. “let’s throw this character into the deep end and see if she can swim” [type stories]. While The Harem Midwife is a sequel to Midwife of Venice, would you say that it’s imperative for readers to have read Midwife of Venice first? Or The Harem Midwife could hold up as a standalone? I think the books stand independently of each other. I think you would probably enjoy the second book more if you read the first one but I don’t think you necessarily have to read the first one first. You can read them out of sequence I guess but I think there’s enough background that I put in The Harem Midwife that people would understand where she came from. I had touched upon this during the Random House book club chat, but with how immersed The Midwife of Venice was in Judaism and Christianity, was it intentional to have the biblical parallels that appear in the book? Did you always have an interest in religion? I’m not a religious person, I’m an atheist, but I’ve always been interested in ritual and biblical stories. I actually like any kind of story as a kid. As a kid I just thought the biblical stories were fascinating. I’ve always loved fairytales as well. Best books you’ve read recently? Do you read other historical fiction or do you prefer other genres? Hilary Mantel’s Bring Up the Bodies. I love audio books and I listen to on audio book and it was 16 CDs, it’s quite a long book. I just thought it was brilliant and it was so well read and I adored listening to it. The other historical novel that I read recently that I thought was wonderful was called Pure by Andrew Miller has a beautiful cover, and it’s set in France. during the French Revolution. It’s about a young engineer whose appointed to clean out a cemetery in the heart of Paris where the corpses are rotting and polluting the water system. It’s very good. At this point, I expressed to her my love for Paris and reading books set in Paris. I would love to set a book in Paris and Paris had a very large Jewish population at one point and there’s a beautiful Jewish museum there. But the time period that I’m writing about in the 16th century there were no Jews. The Jews had been expelled from France and later returned. But if I ever write a book that is set in the 19th century, I will set in Paris in the Marais. I love Paris. When I go to visit cities like Paris, or Venice.. I think, why wasn’t I born a European? This was my destiny! Why wasn’t I born in Paris instead of Buffalo? Why wasn’t I little girl walking down the streets of Paris with a baguette under my arm? We chatted a bit more and she asked about my trip there last year and getting by speaking French. I would be so excited if she wrote a book set in Paris one day! Heck, I already am at the possibility! For Harem Midwife – did you get a chance to visit Istanbul? I was first in Istanbul many many years ago, but more recently my husband and I were in Istanbul for about 2 weeks and then we came back and we spent another 2 weeks in Istanbul and then traveled around Turkey a bit. We had a wonderful time. We rented an apartment in the old Jewish area which is called Fener Balat and Istanbul of course has changed a lot more than Venice has over the years. Venice is kind of a living museum. They’ve made a concerted effort that nothing changes and very few people live in Venice anymore. Most people commute into town. Venice is what they call a living museum they’re only about 60,000 people who actually live in Venice. The reason being is that it’s insanely expensive. And there are very few places to live. The buildings are sinking and a lot of the first floors are not even occupied because they’re filled with water. Istanbul on the other hand is a huge teeming massive city and people actually live and work there. It’s very touristy. I know that 22 million people visit Venice every year. Probably almost that number visit Istanbul now. The Turkish government has in the past say 15 years made a huge effort and, a very successful one to clean up the city and the Topkapi palace where most of my scenes are set has been completely cleaned and renovated and the gardens and buildings redone. Did you know you wanted to set the book there before going to visit? I had been to Istanbul years ago and to tell you the truth it wasn’t in my mind to write a sequel. It was the furthest thing from my mind. First of all, I didn’t even know if Midwife of Venice was going to be published. I had no idea it was going to be successful. I was so happy that it was published I hadn’t even thought about what happens after it’s published. But then it went right on the bestseller list and Random House offered me a two book contract and then I thought, what do I do now? Sequel. And the logical place for a sequel was, fortunately, Istanbul and not some city I had no interest in. That’s how the sequel came to be. I can be a bit of a TV junkie.. so what are you watching right now that you’re loving? My husband and I are in the middle of Foyle’s War. Foyle’s War is a British series and Michael Kitchen plays the lead. It’s set during the war in England in a little fictional town called Hastings. Foyle is the chief of police in this town and the war is going on and he’s solving crimes. With the help of his wonderful sergeant and his driver, who is the most engaging actor called Honeysuckle Weeks. Isn’t that a great name? Shes absolutely adorable. She’s kind of a Girl Scout, jolly hockey sticks kind of girl. It’s a lovely series and we’re quite entranced by it. I’ll look out for [Suits].. you look for Foyle’s War. [M: I’ve since discovered it’s available on Netflix!] The good thing about Foyle’s War is that it’s an hour and a half and you don’t have to watch it in sequence. For example, once it’s over you’re completely satisfied. You’re not debating whether to stay up and watch another one. My great hope is that someone would notice my two books and do a mini series. I think they would make a great mini series. And finally, after two books now, what continues to surprise you about the publishing world? Everything! It’s all kind of brand new to me. What surprises me are the emails I get from people who have read the book. I have a lot of readers throughout the country and in the U.S. and I got an email yesterday from a woman I know who told me she bought my book in a Walmart in Moosejaw, Saskatchewan. And I thought, isn’t that interesting. Moosejaw. Where did that come from? I also get emails from people I knew years and years ago when I was growing up in Buffalo. I got an email when Midwife of Venice came out , I got an email from my first boyfriend who lives in NY.. who’s a filmmaker in NY now saying are you the same Roberta Rich I used to know in Buffalo? I thought, isn’t that nice? That is such an unexpected benefit of being a writer and my maiden name is Rich and it’s the name I’ve used throughout and so old friends do recognize and it’s not a particularly common name. So people do write, It’s very nice to reconnect. The experience that I haven’t had which I would love to have to be on a bus or streetcar and see someone reading my book. That’s an experience I’m waiting for. That concluded the “official” portion of the interview questions but we spent the next 20 or so minutes chatting about everything. Roberta traveled a lot during her first book’s release and to pass the time would play a game with herself to see who in the airport departure lounge looks like someone who would enjoy reading her book. She would then time herself to see how long it takes for her to strike up a conversation with the person and pass along a business card or bookmark. Her best time was 4.5 min and worst was 15 min. With all the traveling I’ve done lately, I have yet to be approached by an author in the airport – how amazing would that be!! She shared her busy week while in Toronto, with several other blogger interviews, a visit to the Indigo head office for a Lunch & Learn and the Bonnie Stern book club where an appropriate dinner meal would be served with the author of the accompany book present to speak about it afterwards. She was also then off to Burlington with Mary Swan and Wayne Johnston to which I mentioned how they had been at the Toronto Bookstravaganza, and Roberta had spoken at the inaugural Vancouver one. We expressed our love for that kind of fabulous event and that Random House is so supportive and appreciative of their authors and bloggers! Roberta then asks me about my blog and blogging which eventually lead to us talking about makeup. She excitedly ran over to her purse and pulled out a small jar of night cream that she had formulated and designed. When she was doing research on Harem Midwife, came across a number of recipes. The girls of the harem had nothing to do but have their slaves rub creams on them. The cream that she has developed is a beautiful lemongrass cream. Great texture, soft but not overly heavy. At one point in her writing, she had Hannah making soap and went on Youtube to make sure that’s how people make soap so she didn’t get it wrong. From soaps, that led to creams and she’s made quite a few batches, even having some of her soaps in a gift basket at the Vancouver Bookstravaganza. She directed me to Swift Craft Monkey to find out more on making my own creams. It was at this point that Lindsey came to get us as I thanked Roberta for her time. It was truly a pleasure to get a chance to chat with her about all different things and I hope she had a great week in Toronto! Thank you again to Random House of Canada and Roberta Rich for this fantastic opportunity.